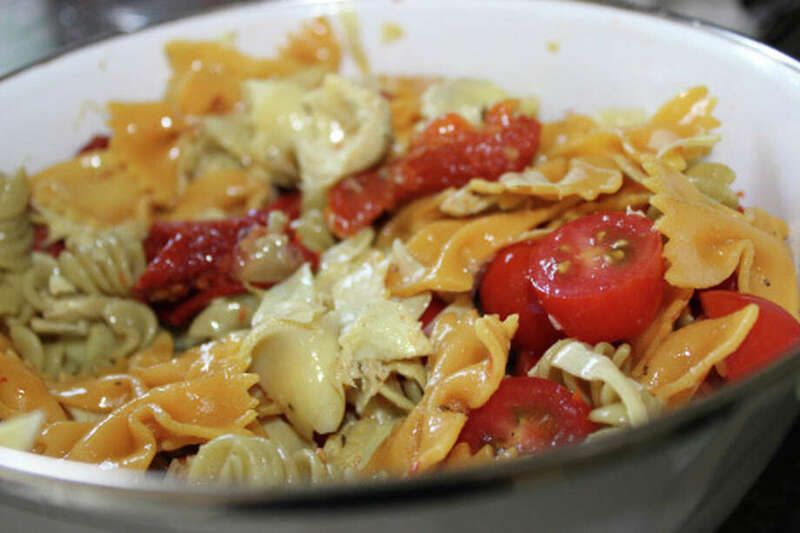 Our food writer, Jenn Press Arata, offers the rceipe for a versatile savory Italian pasta salad. As a playing-the-field vegetarian these days (mostly committed with an occasional spur-of-the-moment fling...), I'm always happy to bring food to a potluck supper I know I can eat. Pasta salad was my choice for a recent summer house-warming party. It goes well with almost anything, travels nicely and can be served at room temperature. Two varieties of veggie-blend noodles give this dish an inviting hue, while tangy sundried tomatoes, artichoke hearts and fresh grape tomatoes add that welcomed savoriness everyone loves. Thanks to Hubby's multiple taste tests as I adjusted the dressing, I channeled my inner Goldilocks and got this one just right. My trick? I used the olive oil packed with the sundried tomatoes in addition to smooth extra virgin olive oil and red wine vinegar for acidity. A little garlic powder, dried basil, salt and pepper were the bow to wrap this light, refreshing summer salad. I went the vegan route to accommodate guests, but this would also be delicious with fresh mozzarella. Perfect to bring to anyone's new house. Even better if you're invited. Prepare pasta according to instructions. Drain artichokes, but do not rinse. Give them a rough chop. Add to pasta. Pour sundried tomato oil from jar over pasta and toss well. Slice sundried tomatoes into halves or thirds, depending on your preference. Add them to the bowl. In a separate bowl, pour in olive oil. Season with garlic powder. Sprinkle in salt, pepper and dried basil. Stream in red wine vinegar. Pour dressing over pasta and mix well. Cut tomatoes in half. Add them to the bowl as close to serving time as possible so they stay crisp.